In order to create effective mobile and tablet sales tools, you need to understand what your customers want and develop a strategy to give it to them on the device of their preference. You may have heard before that mobile internet usage is expected to surpass desktop internet usage by 2015. Mobile doesn’t just mean smart phones though. Tablets like the iPad or Samsung Galaxy are included when calculating mobile usage trends. A mobile site should not be your full website on a smaller scale. With mobile and tablet devices, your real estate is decreased significantly. People on mobile devices are in a different mind frame – whether they’re looking for an immediate purchase, perusing while waiting in line or using as a second screen while watching TV. Another thing to note is typically mobile has a slower connection than a desktop computer. Responsive web design is a great strategy for tablet usage, and can sometimes transfer over to mobile devices as long as the content on your site is not cumbersome. However, if you have a larger website with several photos, a dedicated mobile site and dedicated tablet site can create a more user-friendly experience, which leads to higher traffic, lower bounce rates, and higher lead conversion rates. Mobile and tablet design should follow one principle rule: Keep. It. Simple. Remember how people want to find information on your site in 1-2 clicks? Your navigation menu should be simple and large enough to read on a small screen. If you see in your Google Analytics that your photos, contact and FAQ are the highest traffic pages of your site, those should be on your mobile site. Make it easy to get in touch. 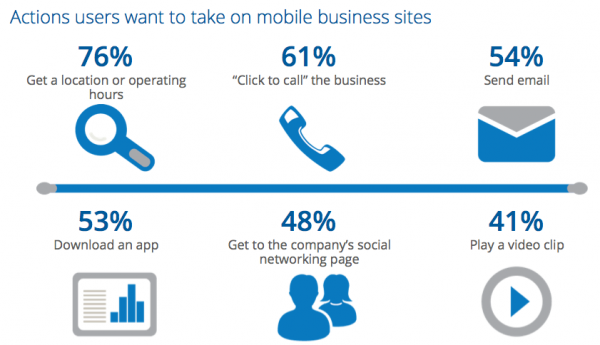 Bottom line, your mobile and tablet sites should have a strategy behind them based on your customer behavior. Without a strategy, you are not taking user experience into consideration, and you are hurting your lead conversion rate.